A line of strikingly simple wooden watches designed to make the wearer feel close to nature. 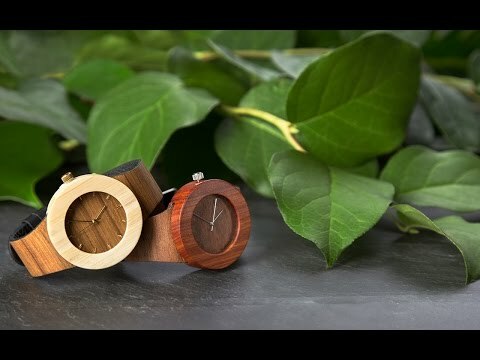 Analog Watch Co. fashions high-quality wood into lightweight timepieces that double as wearable art. Dimensions: Strap: 10" long x 0.75" wide; Body 1.75" x 0.4"
People notice my watch and love asking me about it. Great conversation piece. Super comfortable! Bought this for a granddaughter for Christmas, so this review simply concerns my limited experience whilst in my hands. It is quite nice looking.ice looking. The line first took shape as Lorenzo’s senior thesis. He's an avid nature enthusiast who created his first wooden wrist watches to bring the wearer a little closer to nature. And it didn’t take him long to realize there could be a market for his work. After a successful Kickstarter, Lorenzo found combinations of high-quality woods to create comfortable, and surprisingly lightweight, wearable works of art. . . ones that just happen to keep time. True to Lorenzo’s naturalistic roots, he designs Analog’s watches to work with the wood’s natural grain. From there, he nexted designed watches made of marble—another earthy tribute that's earth-friendly, too. Each watch is mainly biodegradable and packaging is made from recycled raw materials. Plus, as a synergistic way of giving back, Analog plants a tree for every watch sold.